Woda Cooper Companies Inc. will host a Grand Re-Opening on June 11, 2018, at the newly renovated 128-unit affordable townhouse and garden apartment community in Norfolk, VA.
Woda Cooper Companies, Inc. will celebrate the complete renovation of Bell Diamond Manor, a 128-unit affordable townhouse and garden apartment community in the Berkley neighborhood of Norfolk, VA. The firm will host a Grand Re-Opening and Ribbon Cutting at 10 a.m on June 11 at 1009 Middlesex St. Norfolk. The event is expected to draw a large audience of Bell Diamond Manor residents; Norfolk City and area government leaders; state and local housing agency leaders; local media; Woda Cooper representatives; and other friends and supporters of Bell Diamond Manor, including Berkley affordable housing champion Mr. George Banks and other representatives of the Beacon Light Civic League. Bell Diamond Manor was first established by Beacon Light Civic League in the early 1970s under the leadership of Mr. George Banks. Mr. George Banks is credited as a champion of affordable housing and hero of the Berkley community. Mr. Banks was also instrumental in developing a bank and other retail enterprises to serve the Berkley neighborhood. Beacon Light Civic League owned and operated Bell Diamond Manor until recently. Over the years, members knew the complex was in need of a major updates and renovation but they were accustomed to seeking out solutions on their own, with minimal budgets and resources. 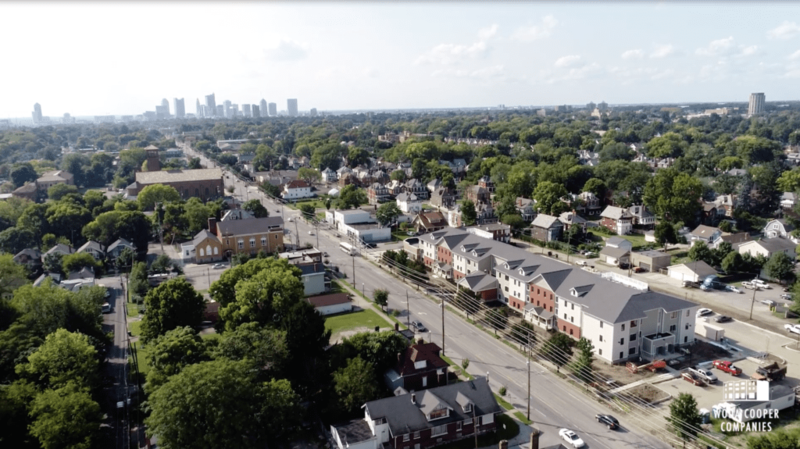 A few years ago they looked to Woda Cooper Companies for new ideas, expertise, and resources to build upon a shared vision of providing high quality and affordable housing in the Berkley neighborhood. The nonprofit teamed with Woda Cooper who led a $14 million renovation at Bell Diamond Manor to replace all roofs, windows, siding, and doors. The two- and three-bedroom units have new cabinetry, painting, wood trim, flooring, low-energy HVAC systems, updated bathrooms, and Energy Star appliances for improved energy efficiency. Sixteen units were redesigned for full handicap accessibility. Woda Cooper also added new community space, lighting, two new playgrounds, and expanded the onsite management office. “The Beacon Light Community League, under the leadership of Mr. George Banks, reached out to us and we were able to provide a concept through a partnership to redevelop Bell Diamond Manor in a way that the residents and wider community of Norfolk clearly have embraced,” said Woda Cooper’s Bruce Watts, Vice President of Development, who was instrumental in the redevelopment. The renovations at Bell Diamond Manor were made possible through the allocation of housing tax credits by the Virginia Housing Development Authority, housing tax credit investment and a FHA 221(d)4 loan for permanent debt by Bank of America. Thirty-five units will continue to receive project-based Section 8 rental assistance through the US Department of Housing and Urban Development in conjunction with the Norfolk Redevelopment and Housing Authority. Bell Diamond Manor offers a high-quality, safe, and lifestyle oriented housing option that is affordable for seniors, workforce singles and families earning up to 60% AMI. At the 60% level, income for residents is restricted to $30,660 for singles, $36,040 for families of two, $39,420 for families of three and $43,800 for families of four. “Bell Diamond Manor is much more than a housing complex,” said Mr. Watts. “Residents are supported through Woda Cooper’s people-skilled management team.” Examples of activities planned at Bell Diamond Manor include a neighborhood block party set for this summer, in conjunction with the local police and fire departments, and a back-to-school celebration this fall. There are also activities directed to seniors such as parties and programs to address senior needs. All residents who resided at Bell Diamond Manor prior to the renovations received relocation benefits per HUD’s Uniform Relocation Assistance (URA) guidelines and many of the residents at Bell Diamond Manor have remained at the complex, transitioning into the renovated units. Some residents with incomes greater than 60 percent AMI (the income threshold for this re-development) moved into first time home ownership. Woda Cooper assisted them in assembling the resources to make homeownership a reality.